Kaiba's RevengeKaiba's back and this time it's personal! When Yugi beat his classmate at a simple game of the collectible card game "Duel Monsters," he didn't realize that Kaiba was Japan's #1 gamer, the impossibly rich heir to the Kaiba Corporation, and a madman who would stop at nothing to get revenge! 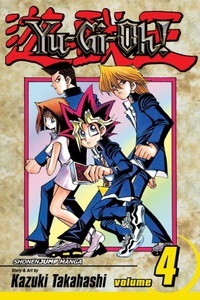 Now, a simple sleepover turns into a struggle for survival as Yugi, and his friends, must survive Kaiba's "DeathT" a THEME PARK of DEATH designed just to send Yugi to an early grave! Using virtual reality to simulate Yugi's own magic powers, Kaiba gives Yugi's grandfather a heart attack, forcing Yugi to undergo "DeathT" with a "Duel Monsters" rematch as the final goal! And Kaiba's little brother, Mokuba, has a score to settle too! With the life of Yugi's grandfather on the line, our heroes must survive lasers, guillotines, and chainsawwielding maniacs! Can Yugi's gaming powers save him now?